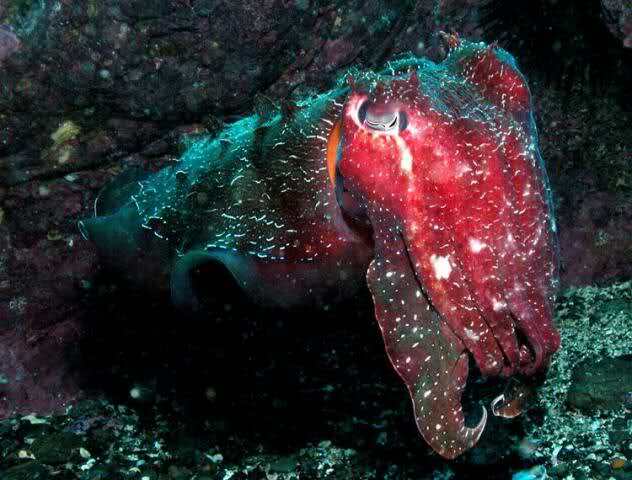 Cuttlefish are marine animals of the order Sepiida. They belong to the class Cephalopoda, which also includes squid, octopuses, and nautiluses. ‘Cuttle’ is a reference to their unique internal shell, the cuttlebone; and despite their name, cuttlefish are true mollusks. Cuttlefish have large, W-shaped pupils, eight arms, and two tentacles furnished with denticulated suckers, with which they secure their prey. They generally range in size from 15 to 25 cm (5.9 to 9.8 in), with the largest species, Sepia apama, reaching 50 cm (20 in) in mantle length and over 10.5 kg (23 lb) in weight. Camouflage is the use of any combination of materials, coloration or illumination for concealment, either by making animals or objects hard to see (crypsis), or by disguising them as something else (mimesis). Examples include the leopard’s spotted coat, the battledress of a modern soldier, and the leaf-mimic katydid’s wings. A third approach, motion dazzle, confuses the observer with a conspicuous pattern, making the object visible but momentarily harder to locate. The majority of camouflage methods aim for crypsis, often through a general resemblance to the background, high contrast disruptive coloration, eliminating shadow, and countershading. In the open ocean, where there is no background, the principal methods of camouflage are transparency, silvering, and countershading, while the ability to produce light is among other things used for counter-illumination on the undersides of cephalopods such as squid. Some animals, such as chameleons and octopuses, are capable of actively changing their skin pattern and colours; they often use this ability both for camouflage and for signalling.